Glitchy, glitchy, glitchy. Usually I can suffer through almost anything for a hidden object game, but Laura Jones and the Gates of Good and Evil was definitely trying my patience after awhile. This is unfortunate, because without the technical hangups, it might have been a halfway decent game. Laura Jones is the student of famed archaeologist, Dr. Adams, who turns up one night to entrust a mysterious amulet into her possession. When Dr. Adams then slips into a coma, it’s up to Laura to uncover the mystery that has penetrated to all corners of the university campus. You must help her find objects and solve puzzles to unlock the secrets behind the titular gates. Put like that, the game sounds really cool, right? Too bad it’s plagued by interminably slow loading screens and a multitude of technical issues that slow the game down to a snail’s pace and cause the sound to hiccup like a drunken bagpipe. I wanted to tear my hair out waiting for the screens to load, and it was horribly frustrating to keep tapping at the same spot over and over again, hoping for something to register. The puzzles were actually more interesting than usual for the genre. Instead of having a long list of random objects to find, usually you are only looking for one or two things to help you solve the puzzle, although sometimes those things are difficult to find or just plain odd. There is a hint system in place if you get stuck, and you can recharge hints by finding question marks in the scene. There are also a variety of mini-games intercut with the main story, which then become available for free play. The writing and general characters were a little on the meh side, but it was clear they were trying to make it a more engaging story than is usual for this style of hidden-object game. The graphics were also perfectly adequate, but nothing about the art style really wowed me. For the most part, I didn’t love the game, but there wasn’t anything all that offensive about it, except for the horrifying number of glitches. I can only hope that these technical issues will be resolved soon, because the game is borderline unplayable as it stands. The puzzles do keep the game interesting, but it isn’t very long and doesn’t offer much by way of innovation, so it will really need to work on making the gameplay seamless if it wants to justify its $2.99 price tag. 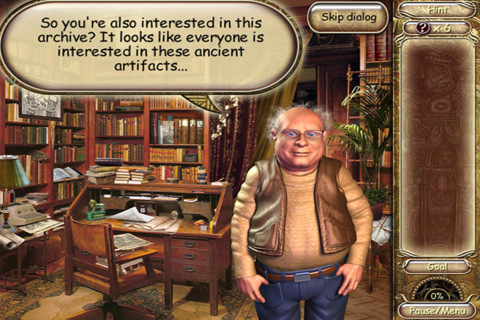 AppSafari review of Laura Jones and the Gates of Good and Evil was written by Tracy Yonemoto on May 11th, 2010 and categorized under Adventure, App Store, Games, Puzzler. Page viewed 3738 times, 1 so far today. Need help on using these apps? Please read the Help Page.